Originally published in the Yellow Springs News on April 6, 2017. In 1774, Goethe wrote “The Sorrows of Young Werther,” a novel in which the eponymous protagonist kills himself after leaving a florid suicide note to his lover. The notion of a romantic suicide was apparently appealing, and a rash of suicides committed by similarly distraught young men followed the book’s publication. According to Yellow Springs resident and Wright State University psychology professor Cheryl Meyer, “Sorrows” helped to popularize the phenomenon of a suicide note. While suicide notes by nature only exist because of the most sorrowful of circumstances, the epistles nonetheless provide significant insight into the psychology of committing the final act, and therefore what might be able to be done to prevent it. Meyer had the chance to study their importance for herself. A few years ago, she came into contact with a collection of 200 suicide notes on file with the Montgomery County Coroner. She had never seen such a compilation and quickly realized the research opportunity it presented. Meyer and three colleagues turned their study of the notes (and 1,800 coroner’s files) into a book, “Explaining Suicide: Patterns, Motivations, and What Notes Reveal.” As the title indicates, the book explores suicide from a variety of different angles, such as the intersection of suicide and legal issues and suicide and severe mental illness, for example, bolstered by the personal accounts expressed in the suicide notes. “We wanted the book to provide information for professionals but also for anyone who has suffered a loss,” Meyer said. The notes are from suicides that took place in Montgomery and surrounding counties from 2000–2009. They run from a matter of words to dozens of pages in length. Some give reasons for the decision and some give thorough post-death instructions. Many are apologetic and express love for the family members left behind, and many notes express hatred toward the world and the miserable vicissitudes of life. Many letters are from terminally ill patients who chose to end their suffering. Notes left by terminally ill people tend to be exceedingly short, Meyer said, as they do not feel like they have anything to explain, while notes outlining interpersonal drama tend to be much longer. The unusually large collection of notes provided data that allowed researchers to pursue aspects of the phenomenon that haven’t yet been studied, Meyer said, such as the correlation between DUIs and suicide and the psychology of those who choose to kill themselves in front of other people. The book also analyzes the role of “hegemonic masculinity” in violence aimed at the self, as a culture of hyper-aggression and competition can lead to a profound sense of failure, which in turn leads to suicide as a way to escape those feelings of inadequacy. Impulsivity and access to weapons can prompt acts that might otherwise not occur, she said. Meyer didn’t set out to be a suicidologist but rather found herself in the field thanks to a few twists and turns of her career. Admittedly compelled by the macabre from a young age — her mother was fascinated by Chicago gangsters and gave her a book about famous criminals when she was a kid — Meyer went on to get her law degree and began studying the different ways that the law handled post-partum depression. Her research got her in touch with another scholar studying mothers who kill their children, and the two eventually collaborated on a book, “Mothers Who Kill Their Children.” Meyer said she is “one of about three” people in the country who have studied maternal filicide extensively, but after a number of years researching and writing on the phenomenon, it was time to move on. 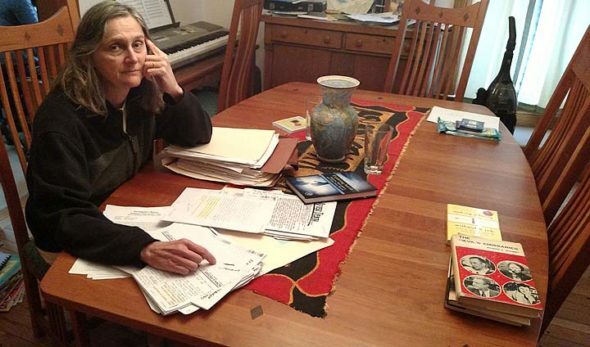 When the opportunity came to study the cache of suicide notes and coroner’s reports, Meyer said with a dark chuckle that she appreciated the chance to study a slightly less upsetting topic than what she was working on before. Meyer said she loves medicine and considered being a doctor, but working with real blood and bodies was not something she could do. Meyer and her colleagues looked at the social factors that cause suicide but also places that seem to be conducive to longevity and happiness, called “Blue Zones.” These blue zones tend to include positive attitudes toward exercise and healthy eating, Meyer said, but more importantly foster a sense of social connectedness and emphasis on family. In African-American communities, for example, faith and extended family networks are a more present part of life, fostering a sense of community that may account for significantly lower rates of suicide among that demographic. Were these sorts of relationships and factors present in communities on a wider scale, perhaps seemingly insurmountable problems might seem less daunting, she said, citing the suicide of an elderly man who thought that the fallout from a fender bender would culminate with him being forced into a nursing home. Had there been a greater support network, someone could have helped assure him that such an outcome wasn’t inevitable. But in exploring the decision to commit suicide, the book has helped people come to terms with the choice of a loved one to end his or her life. Meyer said she has received calls and emails from people telling her the book that the book helped them unburden themselves of guilt, or the sense that nobody can understand what they’re going through. Despite the ways in which her research has helped people, Meyer is debating how much more suicide research she can undertake. It’s an obviously weighty topic, and while she said she is good at compartmentalizing her work, the 8–10 hour days of locking herself in her office with such dark sentiments takes a toll on even the most curious and hardy researcher. Meyer is an avid swimmer and is sometimes able to discuss her work with her partner, Deb Zendlovitz, though sometimes there are things she’s researched that she doesn’t feel like anybody else should know. Zendlovitz said she recognizes the “rich trove” of information the notes constitute and appreciates the nature of her partner’s field, but agrees that there are many things she “doesn’t want to think about or know about.” Much of what she has learned already has stuck with her, she said, and many of those things she wouldn’t mind forgetting. Part of the emotional difficulty comes from a sense of getting to know the people writing the letters, Meyer said. She feels the authors’ loneliness and gets angry when someone commits violence out of spite. The personalities of the authors shine through, she said, and it’s easy to lose a sense of the notes’ terminal nature. Reading some notes, she hopes that the person can overcome his or her difficulties, but then she remembers why she is in possession of the letter in the first place. The Montgomery County Coroner still has a collection of notes from 2010 to the present, another trove that could conceivably inspire further research or another book. However, Meyer acknowledges it is an incredibly compelling topic, and sadly a fact of life. For that reason, it should be studied and understood. She already has a few articles in the works that build on the research they’ve already done. In those tragic cases where someone takes himself out of this life, the insights gleaned from the book can help friends and family try to understand the decision, even if they never forget that it was made.